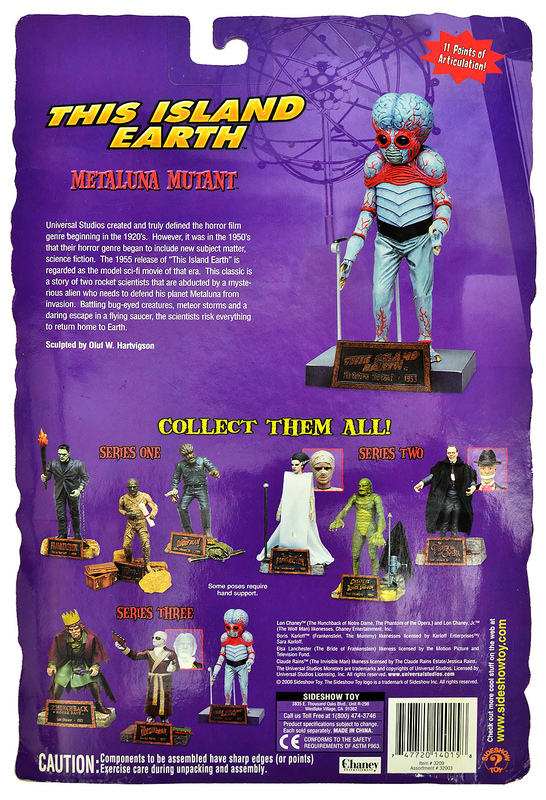 Universal Studios Monsters: Metaluna Mutant action figure by Sideshow Toy (2000) | 'TAIN'T THE MEAT… IT'S THE HUMANITY! This Island Earth tells the story of Dr. Cal Meacham, played by Rex Reason, a nuclear scientist (and jet pilot!) who is recruited by an ultra-secret think tank. Meacham, along with fellow scientist Dr Ruth Adams (Faith Domergue) quickly realises that the group is really a cover for a group of alien scientists desperately seeking uranium to help save their home planet of Metaluna. Meachum and Adams are promptly whisked away by flying saucer to the planet by a Exeter, the Metalunan scientist charged with repairing the planet’s defence shield before it succumbs to attack by an enemy civilisation. Sadly their efforts come to nought as Metaluna is destroyed shortly after their arrival, but not before Meachum and Adams are rescued and returned home by a fatally injured Exeter. Although the film has some good bits (the effects were praised at the time) This Island Earth really isn’t that good, and it hasn’t stood the test of time. The film is now remembered mainly for only two things: being satirised in Mystery Science Theatre 3000: The Movie (1996) and for the appearance of the Mutant creature at the end of the film (it’s the monster that mortally wounds Exeter). I remember watching the film when I was a kid and the Mutant scared the hell out of me; its creepy mix of insect and crab, and that giant veiny blue brain, was genuinely scary. 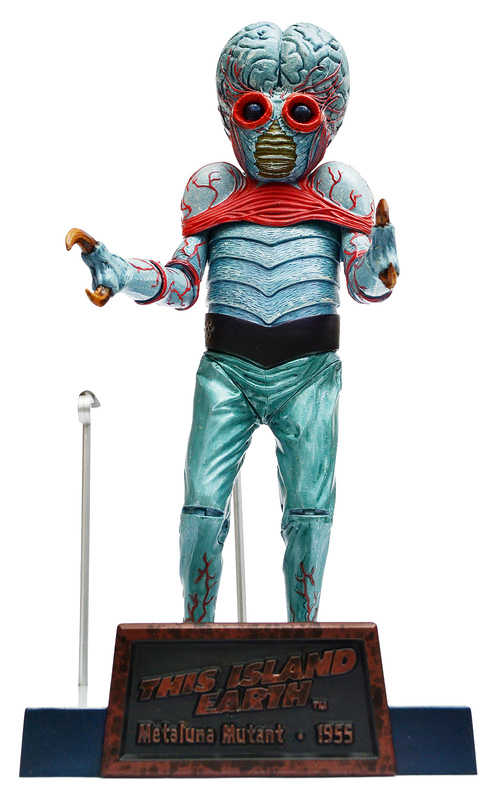 Out of all of Universal Studios’ pantheon of monsters the Metaluna Mutant is undoubtably the most hideous. 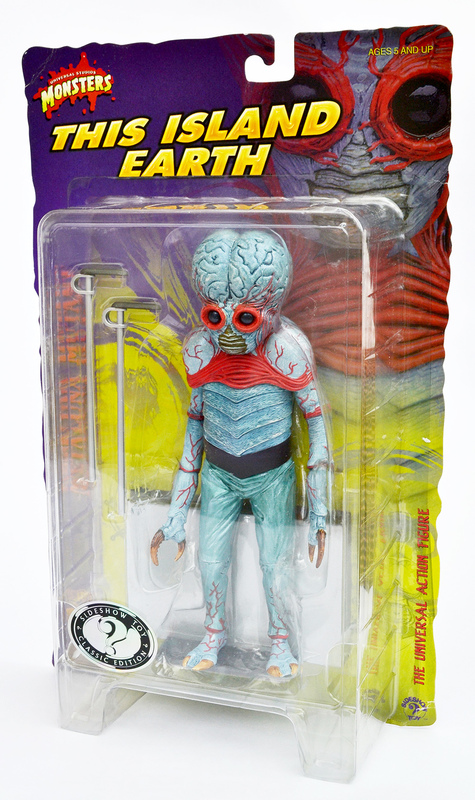 Universal Studios Monsters Metaluna Mutant from This Island Earth was released by Sideshow Toy in 2000 and was part of Series Three of the collection. The action figure stood 9½ inches tall (when placed on its base) and shipped in a cardboard-backed blister pack, the back of which featured a short synopsis of the film and showcased other figures from the collection available at that time. 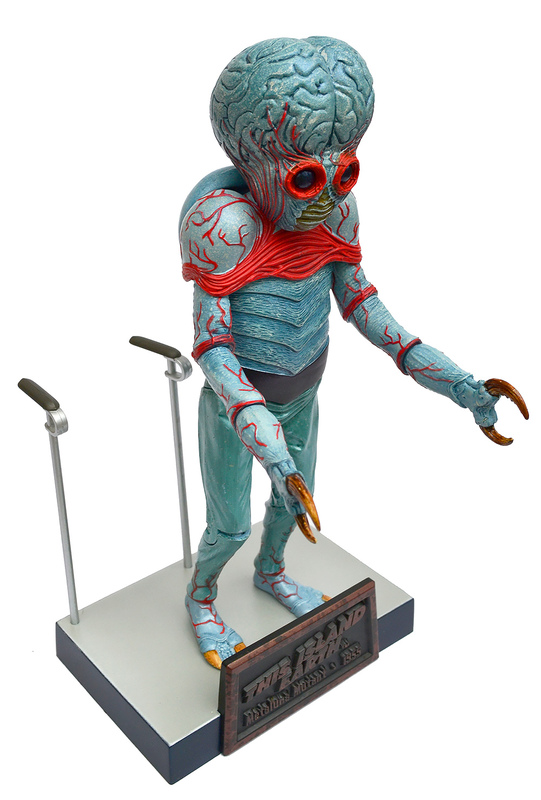 The Metaluna Mutant featured 11 points of articulation and shipped with two accessories: the magnetic hand rails from the flying saucer’s conversion tubes. Also included was a base with a nameplate that featured the film’s legend. 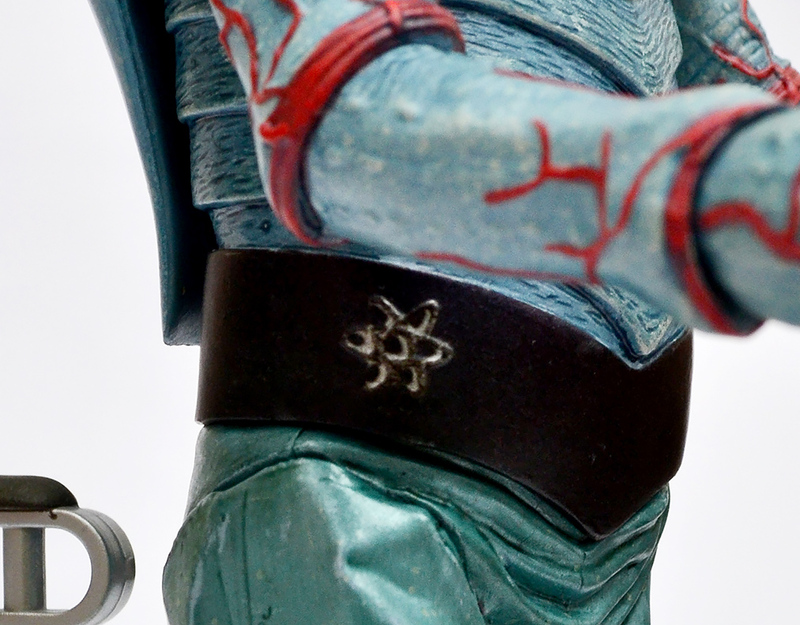 The inclusion of the atom symbol on the Mutant’s belt is a nice touch. The action figure was based on a design by Oluf W. Hartvigson, who sculpted most of the figures from the Sideshow Toy collection. As with the other figures Hartvigson did a great job with the Mutant. The high level of detail is very impressive, particularly on the creature’s veins and its brain. There’s some subtle, yet impressive texturing on it’s breast plate, and even the monster’s infamous blue slacks feature realistic creases. (According to movie lore the original design for the Mutant included realistic insect legs but the special effects team ran out of time trying to get them right and had to plumb for slacks instead, a source of no little amusement to the MST3K guys). Hartvigson even included an atom symbol (used liberally throughout the Metalunan flying saucer) on the creature’s belt — a nice touch. Finally, the paintwork is also excellent, with some nice tonal shading on the Mutants body and brain. The level of detail, and the paintwork, really bring this monster to life. Due to its age the Universal Studios Monsters Metaluna Mutant is no longer readily available, but new copies do occasionally pop up on ebay. Be warned: they’re not cheap, with BNIB editions selling for more than £30/$40. Sideshow Toy also released a black and white Silver Screen Edition of the figure, which will set you back even more. The Metaluna Mutant, from all sides. The Metaluna Mutant is one of my favourites from Sideshow Toy’s Universal Studios Monsters collection. The hight level of detail and the fine paintwork really do justice to this gruesome creature. 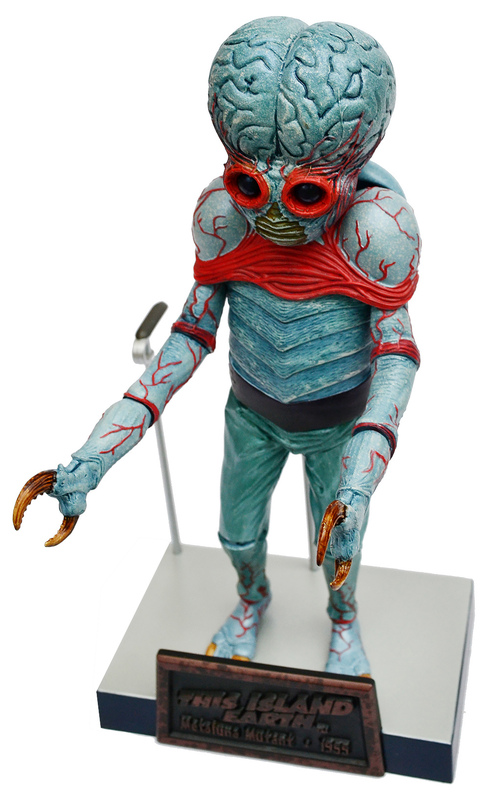 This Island Earth may not be a classic of 1950’s science fiction cinema, but with the Metaluna Mutant it did introduce one of filmdom’s most distinctive and frightening monsters, and for that it will not be forgotten.